Our results and testimonials are from real life volunteers that used Vital 3 Derm Anti-Aging Cream for 30 days. These are the great results! After just 30 days, wrinkles and fine lines are less visible, the skin tone is more even and looks radiant and plump. Around the mouth and under the eyes the fine lines disappeared or decreased significantly. "I really enjoy the smooth creamy texture. Vital 3 Derm Anti-Aging Cream was non-oily and felt great on my skin. After using it my skin felt softer" Erika S.
Notice under the eyes again how the skin has less wrinkles and looks firmer. 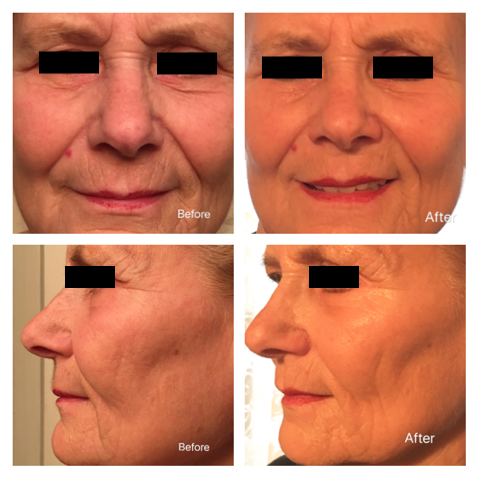 Her skin has a more youthful appearance. 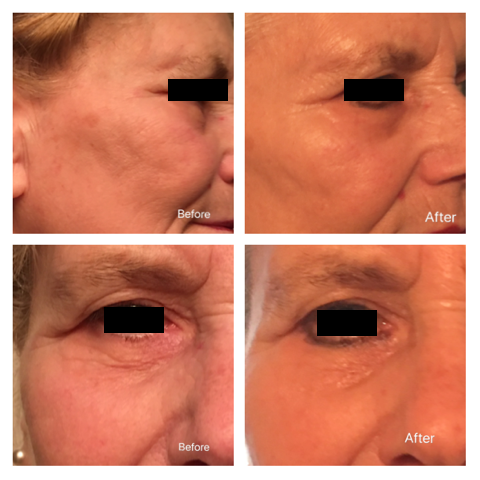 After a 30 day trial while using 5 other Dermatology strength products there was still an improvement in fine lines and wrinkles, moisture, and tone. The top arrows show diminished wrinkles and the lower arrows show a more even tone with sunspots on the right cheek. I began using his face cream about 4 weeks ago, not really expecting to see an improvement in my skin. But ... I did! I didn't think I would see an improvement, because I already use a very good skincare line called XXXXXX. If you are interested in seeing the "before and after" photos I took of myself (with no makeup) and hearing more about my experiences with Vital 3 Derm cream, please let me know. I can recommend his cream in addition to anything else you may already be using. It works! I'll be selling it at Image Awareness Center very soon! After using Vital 3 Derm for 30 days the skins tone was more even as can be seen with the arrows here. This sunspot was almost completely corrected. "(1) the numerous lines on my forehead, which I lovingly earned from too much time spent writing and editing on my computer without glasses, have all but disappeared when I’m not squinting or otherwise squishing my forehead; (2) the skin on my face and around my eyes is firmer which has reduced the lines underneath my eyes and made it a lot less noticeable that I don’t get anywhere close to enough sleep"
"Overall, I would highly recommend Vital 3 Derm Anti-Aging Cream to anyone who is experiencing the same types of issues as me or other issues associated with aging or sun damage. You will definitely see results and you won’t have to wait too long to get them. I was beyond surprised at how noticeable the difference was for me personally and how little time had passed. It may take a bit longer for those that are older (again, not disclosing my age), but based on my experience, the results would be even better."